The last day Indi was supposed to wake up early for a game of golf, but the rain did not stop so everybody ended up waiting at the café and enjoying a prolonged breakfast amidst the rain. 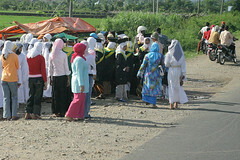 Finally, nearing 10am, everybody decided to cancel the golf game and boarded the bus to lake Maninjau. It was a long yet scenic drive to the lake. 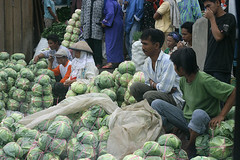 We passed by a vegetable market, and I thought that I had never seen vegetable that fresh before. But who wants to buy cabbages that have been sat on for hours? The second day we woke up and almost late for breakfast. Indi had a quick shower, I didn't and neither did Noe. Noe slept really soundly, and it was rather difficult to wake him up. But we woke him up anyway, and he was quite fussy in the morning because of this. Luckily, Eyang Kakung took Noe to swing in the playground and Noe's back to his usual self. After Nasi Goreng breakfast, we boarded the bus for a long drive to Bungus Bay. On the way, we saw a lot of unique sights such as graduation parade for religious schools and various kinds of decorated vehicle. After about one and a half hour drive we arrived at the bay and took the boat to Sikuai Island, a tiny island off Sumatra at Indian Ocean. The boat journey took us 45 minutes. Last weekend we did a short trip to West Sumatra. It was Noe's first trip to visit the land of his great-grandmother. We took Tiger Airways flight 222, from the budget terminal. Noe was really excited when he arrived at the terminal building, because it was so spacious. After checking in, we had breakfast at Han's café, before boarding into the plane. This is our first time taking a flight and had free-seating arrangement. The stewardess told us that we need to sit in the back in order to distribute the load of passenger evenly. I guess the plane won't fly if all the passengers sit in the front only, since the plane's nose would be too heavy to lift. There are two things that caught our attention during last week’s trip in West Sumatra. First thing is the unique signs that can be found along the way. Second is how vehicle here is always intricately decorated. Let me present to you the second thing: about the unique decorations on buses and trucks in West Sumatra. Let me present to you the first thing: about the unique signs that are found along the way. Some of you may have read Rani's writing entitled How online auction works in Singapore. Given the fact that most Singapore-based online auction sellers and buyers ("participants") do not act according to the international norms that you normally see happening in Singapore Yahoo! Auctions and eBay Singapore (US and Europe being the best example of how online auction should be conducted), I was wondering if you any of you have channels to the Singapore government entity that has the power to regulate how buyers and sellers behave. I called one of my good friends (who are married, with children) to see if they want to attend Indo Sing Mum picnic to be held this Saturday at Botanic Gardens, Singapore. One of the responses/questions I got about the event is (paraphrased/translated into English): Are there many Indonesian Chinese? Some say that what they like the most about Singapore is when they "leave" it, not when they "live" in it. I am saying this because we are about do another getaway and experience "leaving it". In light of Kenny Sia's genuine interests in getting his "little bird" altered, I highly recommend that he become the spokesperson of SmartKlamp, specializing in the fine art of male circumcision.